The compact SWIR 640CSX video camera is designed for applications requiring small Size, Weight, and Power (SWaP) as well as high sensitivity. 1.25 x 1.25 x 1.20 in. The Sensors Unlimited Micro SWIR Camera features a 640x512 pixel, high-sensitivity, stabilized InGaAs snapshot imager and utilize Sensors Unlimited’s image enhancement algorithms to produce highest quality imagery in all lighting conditions. 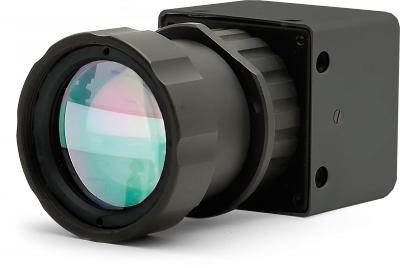 The camera provides real-time daylight to low-light imaging in the Short Wave Infrared (SWIR) wavelength spectrum for persistent surveillance, laser detection, and penetration through haze and smoke. On-board Automatic Gain Control (AGC) optimizes the camera's imagery throughout day and night imaging scenarios. Camera Link ® digital output provides for plug-and-play video with 12-bit images for digital image processing or transmission. The light weight, compact size, and low power is ideally suited for integration into solider systems and small UAS. Optional NIR/SWIR technology is available to extend the sensitivity of Sensors Unlimited cameras below 0.9 μm, offering the advantage of both Near Infrared (NIR) and Short Wave Infrared wavelength response.